Toto has had it way too easy for way too long. For decades he's enjoyed his status as pretty much the only dog in the magical land of Oz, but now that's all about to change. Because it's time to put a new twist on the Wizard of Oz, where there's more than just one canine role up for grabs now. 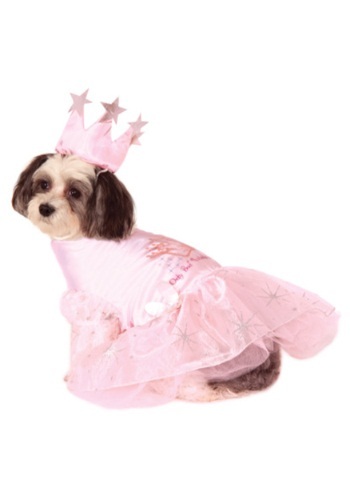 And who better for your good-natured little pooch to play than the legendary Glinda the Good Witch? With this adorable Glinda Pet Costume, your best friend can finally play fairy godmother to your Dorothy this Halloween! With just the dress and the crown, becoming the most glamorous witch in the land of Oz is a simple two-step process for your pup. The dress stays in place thanks to velcro, and with an adjustable chin strap, Glinda won't have to worry about losing her crown as she hops down the Yellow Brick Road with you. So this Halloween, let your little friend take part in your Oz group costume with the Glinda Pet Costume!